Watch on Frontier FiOS Channel 39 and Cox Cable TV Channel 35! The City of Rolling Hills Estates is pleased to present the Annual Palos Verdes Peninsula Holiday Parade with the assistance from Pageantry Productions. 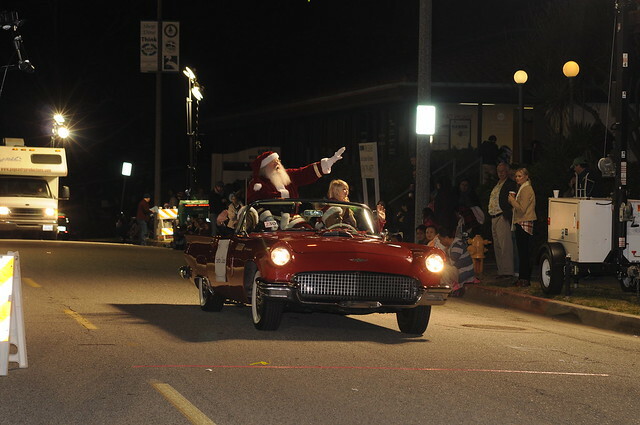 The “Parade of Lights” theme is designed to showcase the unique character of the Palos Verdes Peninsula. The parade route is along Silver Spur Road and Deep Valley Drive, through the Promenade on the Peninsula to Norris Center Drive (Crossfield Drive) in the City of Rolling Hills Estates. After which, the Award's Ceremony is held at The Promenade on the Peninsula. Veteran Parade Announcers Michele Swanson, Brenda Barnes, and TV & Radio Personality Mike Whitehead are excited in returning to Co-Host this holiday parade. The parade will broadcast on Frontier FiOS channel 39 and Cox Cable TV channel 35, and professionally produced by Manhattan Beach Studios. Additionally, there is bleacher seating and ample sidewalk space for you and your family to hear the three banter from their broadcast table inside the Show Mobile that will be located in front of the PV Library on 701 Silver Spur Road. Area businesses interested in innovative methods of promotion are encouraged to become a sponsor of a parade unit. The parade receives extensive local media coverage and draws thousands of spectators and participants from the entire South Bay region. As a sponsor, the name of your business will be printed on approximately 10,000 “bag stuffer” flyers distributed at local grocery stores in the days and weeks leading up to the parade. Your name will also appear in advertisements in the Peninsula News, press releases to local newspapers, and on the local cable television spots. A variety of parade units including bands, scouts, youth groups, equestrians, floats, drill teams, cheerleaders and antique cars will be participating. A 3 x 8-foot banner indicating “Presented By (Your Business/Organization)” will be carried by youth volunteers in front of the parade unit you select to sponsor. Parade Unit sponsors will also receive four (4) tickets to sit in the VIP Parade Viewing Stand. All parade units will be judged by professional judges. At the conclusion of the parade, awards will be distributed to the various parade unit categories. The best equestrian unit in the parade will be issued a large Equestrian Sweepstakes Trophy. As a sponsor, the name of your business or organization will be engraved on the trophy. The Equestrian Sweepstakes Trophy sponsor will also receive four (4) tickets to sit in the VIP Parade Viewing Stand and may participate in presenting their Sweepstakes Trophy at the Parade Awards Ceremony. All parade units will be judged by professional judges. At the conclusion of the parade, awards will be distributed to the various parade unit categories. The best overall unit in the parade will be issued a large Sweepstakes Trophy. As a sponsor, the name of your business or organization will be engraved on the trophy. The Sweepstakes Trophy sponsor will also receive four (4) tickets to sit in the VIP Parade Viewing Stand and may participate in presenting their Sweepstakes Trophy at the Parade Awards Ceremony. Local businesses can join the parade fun by decorating their commercial vehicle and entering it as a parade unit. Awards will be given to the business with the best parade unit entry. Parade Floats, Marching Bands, Equestrian Units, Classic Cars, Drill Teams, Community & Civic Groups and a special appearance by Santa Claus! Sponsors: Promenade on the Peninsula, Peninsula Shopping Center, AMUSE Music Center, Bennett Landscape, Inc., Trimming Land Company, El Pollo Inka, Palos Verdes Peninsula Transit Authority, Medawar Fine Jewelers, Rolling Hills Dental Group, DGCC.com, Pilates and Yoga Room.